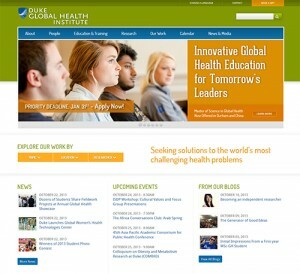 Welcome to the Duke Global Health Institute WordPress network. Here you will find a directory of faculty and initiative websites. DGHI brings together the best minds, from all corners of the university and the world, to improve global health equity. Please direct any questions to globalhealth@duke.edu. The Duke Global Health Institute brings knowledge from every corner of Duke University to bear on the most important global health issues of our time. DGHI was established as a University-wide institute to coordinate, support, and implement Duke’s interdisciplinary research, education, and service activities related to global health. DGHI is committed to developing and employing new models of education and research that engage international partners and find innovative solutions to global health challenges.